We are proud to share your stories with our Medical School community in Class Notes. 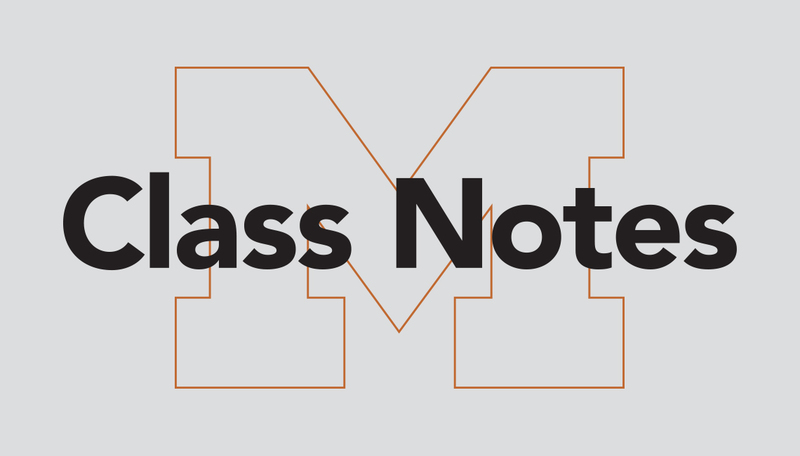 Submit your alumni news for Class Notes at medicineatmichigan.org/submit-class-notes. Leopoldo Montes, M.D. (Residency 1959), and Donald Schuster, M.D. (Residency 1958), both dermatologists, collaborated on a book celebrating their chief resident and mentor, Arthur C. Curtis, of the U-M Department of Dermatology. The book, Arthur C. Curtis and the Department of Dermatology, will be released later this year. Thomas J. Haverbush (M.D. 1965) and his wife established the Alice M. and Thomas J. Haverbush, M.D., endowed scholarship in U-M Men’s Ice Hockey for student athletes. Haverbush is also a member of the Board of Trustees for Alma College. Herman B. Gray (M.D. 1976) has been named president and CEO of United Way for Southeastern Michigan. Gray served as executive vice president for pediatric health services at the Detroit Medical Center. John Goldblum (M.D. 1989, Fellowship 1993), chair of the Department of Pathology at the Cleveland Clinic, co-edited the 11th edition of the surgical pathology textbook, Rosai and Ackerman’s Surgical Pathology. Goldblum is also president of the U.S. and Canadian Academy of Pathology. Sriram Narsipur (M.D. 1988) was recently promoted to chief of nephrology at Upstate Medical University in Syracuse, New York, where he is also director of transplant nephrology and medical director of dialysis programs. R. Arturo Roa (M.D. 1985), an otolaryngologist-head and neck surgeon, was recently elected as a member of the Holzer Health System Board of Governors and Board of Directors, located in central Ohio. Anthony D. So (M.D. 1987) has been named director of the Johns Hopkins Center for a Livable Future, and will be the inaugural Robert S. Lawrence Professor in the Department of Environmental Health Sciences at the Johns Hopkins Bloomberg School of Public Health. Mark LePage (M.D. 1995, Residency 2000, Fellowship 2001) was named chief medical officer of Marshfield Clinic in Marshfield, Wisconsin. Previously, LePage served as chief medical officer of Security Health Plan and as an interventional radiologist at the clinic. Donald Little (M.D. 1993) was named medical director of First Choice Emergency Room’s Arlington-Little Road facility. Little served as a physician in the U.S. Navy and as the chief medical officer at Dallas-Fort Worth Urgent Care in Texas.